Comment of the reviewer Mariana Ciocchini, MD. DAOMI, Centro Integral de Nefrología, associated to Facultad de Medicina de la Universidad Nacional de Buenos Aires, Argentina. Es un hecho ampliamente conocido que en el paciente portador de enfermedad renal crónica, a medida que desciende su filtrado glomerular, se incrementa la excreción fraccional de electrolitos y sustancias nitrogenadas. Sin embargo, no se ha descripto aun la curva que grafica dicha correlación para el manejo del fósforo y del ácido úrico en dicha población. Surgió entonces la inquietud de describir la curva que refleja el cambio progresivo de la excreción fraccional de dos sustancias de eminente manejo tubular proximal, una por medio de la reabsorción tubular (fosforo) y la otra por medio de la secreción tubular (ácido úrico), dado que dichas curvas podrían ser utilizadas en la práctica clínica para evaluar cómo se encuentran en un paciente portador de enfermedad renal crónica dichas funciones tubulares. It is a widely known fact that in the case of a patient who suffers from chronic kidney disease, as his/her glomerular filtration rate decreases, his/her fractional excretion of electrolytes and nitrogenous substances increases. This phenomenon explains why the serum levels of such substances stay at a normal range until patient´s glomerular filtration rate decreases below a cut off value which varies in case of nitrogenous waste (urea, uric acid), divalent ions (calcium, phosphate, magnesium) or monovalent ions (sodium, potassium, chloride)1. Nevertheless, to our knowledge, it has only been described in patients who suffer from chronic kidney disease, the curve which relates the progressive decrease of the glomerular filtration rate with the corresponding increase of the fractional excretion rate of sodium and potassium2. On the other hand, the importance of not only evaluating the glomerular function in chronic kidney disease but also the tubular function since its participates in the elimination of uremic toxins which due to its size cannot be eliminated via the glomerulus, is increasingly more recognized nowadays3. Therefore, arose the question of describing the curve that reflects the progressive change from the fractional excretion of two substances of eminent proximal tubular handling, one of them through tubular reabsorption (phosphate) and the other through tubular secretion (uric acid), since such curves could be used in the clinical practice to evaluate how a patient who suffers from chronic kidney disease handles such tubular functions. In 32 patients who suffer from different stages of chronic kidney disease secondary to glomerular causes (stages I to V) creatininemia, phosphatemia, uricemia in serum and 24-hour urine samples were measured. Since phosphorus has a a plasmatic protein binding of approximately 30%, serum values of such substances were multiplied by 0.7 before calculating its fractional excretion rate. This correction (0.7 multiplication) was not necessary to obtain the fractional excretion of uric acid (FEUA) since it has low binding to serum proteins (<5%). 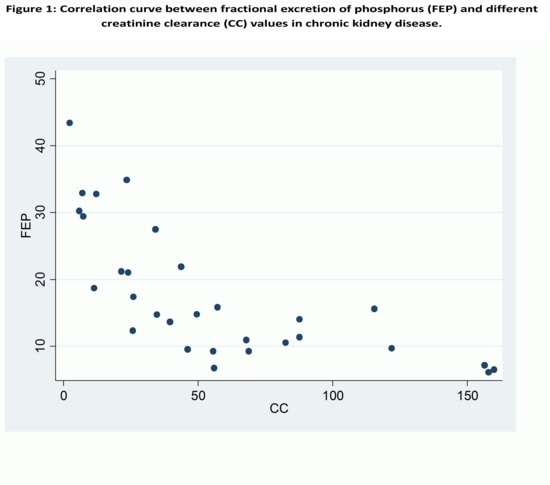 The fractional excretion of phosphorus (FEP) was obtained in the 32 patients studied while the fractional excretion of uric acid (FEUA) was obtained in only 21 of them. All the patients consented to having their tests carried out. Based on he obtained data, two curves were outlined, resulting on one hand the different levels of creatinine clearance (abscise) based on normal values to very low, and on the other hand the value corresponding to the fractional excretion of phosphorus (ordered) in one of the curves (Figure 1), and uric acid (ordinate) on the other curve (Figure 2). Therefore, a significant correlation was documented between the decrease in creatinine clearance and the increase in the fractional excretion of phosphorus and uric acid in patients who suffer from chronic nephropathy secondary to glomerolopathies. There is an increase in the serum levels of these substances due to the decrease in the glomerular filtration rate secondary to kidney disease, which leads to the increase in the gradient between the concentration of substances in blood of the peritubular capillaries and its concentration in pre-urine of the tubular lumen. The increase of urinary flow in the remaining healthy nephrons which is a consequence of the compensatory hyperfiltration they are subjected to, which reduces its capacity of tubular reabsorption. The inhibition of the proximal reabsorption of phosphorus under the effect of paratohormone, whose levels tend to increase in chronic kidney disease. The increase of the activity of the transporter system of organic acid, which contributes to increase the secretion of uric acid. It is important to mention that their treatment with angiotensin converting enzyme inhibitors (ACEI) or antagonists of the angiotensin II receptor (ARA), drugs of eminent proximal distal tubular action were not suspended in purpose, due to the fact that the curves of fractional excretion of phosphorus and uric acid could be useful to evaluate the proximal tubular function in patients with chronic nephropathy, who are normally receiving these kind of drugs, which is why it was decided to describe these curves with the patients under the effect of such drugs, to be able to reflect the habitual context in which such graphics could be used. Additionally, the fact that the patients with chronic kidney disease are normally medicated with these type of drugs (ACEI, ARA) which reduce the distal potassium secretion, makes the curve which correlates the fractional excretion of potassium with the glomerular filtration rate reduction in chronic kidney disease (described by Battle et a.) not useful for monitoring tubular function in this population2. 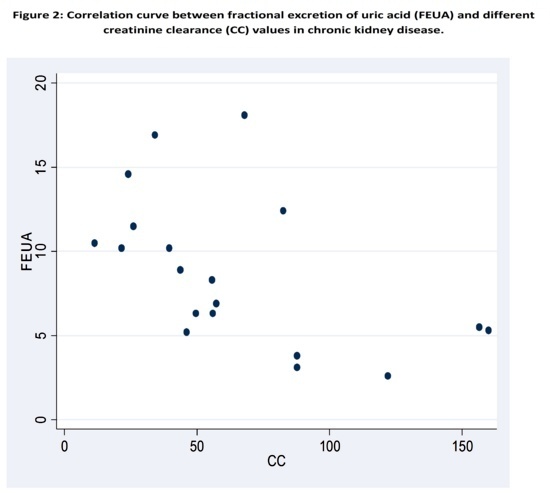 There is a significant and inverse correlation between the creatinine clearance value and fractional excretion of phosphorus and uric acid in patients with chronic kidney disease. The authors declare not having any conflict of interests. In this work the authors have been able to describe in an original way the curve that correlates the fractional excretion of two substances of eminent proximal tubular management (phosphorus and uric acid) in relation to the fall of the glomerular filtrate rate secondary to chronic kidney disease. It is very interesting the proposal to evaluate the tubular function in chronic renal patients given the importance of this renal function possesses in the elimination of uraemic substances by tubular secretion. It is a very interesting idea that deserves to be explored in depth by future studies. .